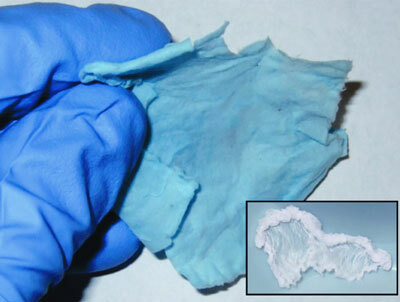 (Nanowerk News) Scientists in Texas are reporting development of a first-of-its-kind cloth that releases nitric oxide gas — an advance toward making therapeutic socks for people with diabetes and a wrap to help preserve organs harvested for transplantation. The study is in ACS’ Chemistry of Materials ("Novel Delivery System for the Bioregulatory Agent Nitric Oxide"). Porous materials termed zeolites, incorporated into this cloth, point the way to therapeutic bandages and wraps that can deliver healing nitric oxide. Kenneth Balkus and Harvey Liu note in the new study that nitric oxide (NO) helps increase blood flow and regulates a range of other body functions. Scientists have tried for years to find practical ways to store and deliver NO for use in medicine. However, they have had difficulty finding a suitable material that allows controlled delivery of NO. Recent studies suggested that zeolites could work. These porous materials soak up and store large amounts of gases like NO.